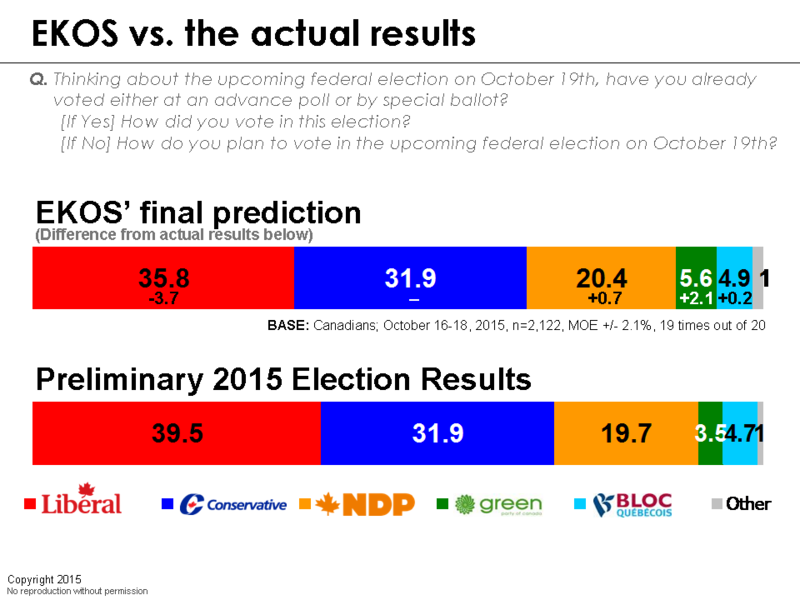 [Ottawa – October 20, 2015] After an exciting 78-day campaign, the 42nd Canadian general election has come to a close. We at EKOS believe we did a very good job in charting the direction of what was a rollercoaster campaign. In the end, we correctly predicted that the Liberals would return to power (and we noted the possibility of a majority), although we acknowledge that our final estimate of the Liberal support fell slightly outside the margin of error. We were, however, spot-on in terms of the final Conservative, NDP, and Bloc numbers, although we overestimated Green Party support. In our final release, we identified five areas of uncertainty. Now that the final election results are in, we believe that we are able to address the issue of how these potential sources of error played into the final results. 1. Will the Liberals trend further upward? 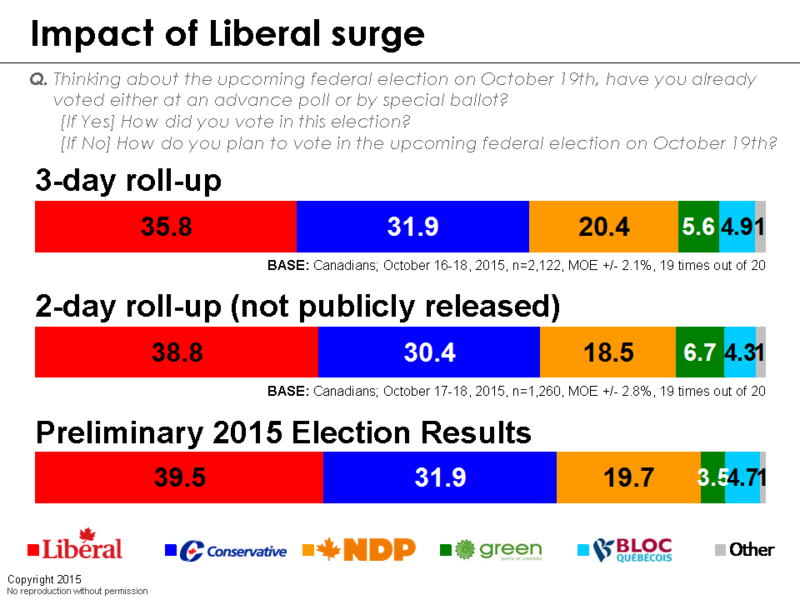 As noted by a number of pollsters, there was a last-minute surge in Liberal support. In our final release, we clearly noted that the Liberals might trend upward even further. It appears that this was indeed the case, particularly in Quebec and British Columbia. To meet Sunday’s reporting deadlines, we had to shut down calling at 4:00 pm EST which, given Canada’s time zone differences, gave us a calling window of just two hours in some regions. We simply had too few cases in Western Canada to offer a robust dataset and we felt that it would have been irresponsible to use these figures as our final prediction. We feel that it is inappropriate to report on multiple predictions and then, after the election, root around in the bin for the most accurate set. 2. Will cellphone-only households actually show up? As always, we are going back and conducting a post-election survey to look at the demographic differences in turnout but, based on Canada’s much higher than usual turnout (~68 per cent), it is clear that cellphone-only households did indeed show up to the polling stations. 3. Is the late senior conversion to the Liberals genuine? Again, we will be better positioned to answer this question once our post-election survey is complete, but we would speculate that the senior conversion to the Liberals was indeed genuine. 4. Why are Liberals higher with a live interviewer than with the robot? We do not have a clear answer to this question at this time, but we will be reporting back on this soon. 5. How will Quebec and British Columbia conclude? In our final release, we warned that Quebec and British Columbia were highly confused and unclear races. 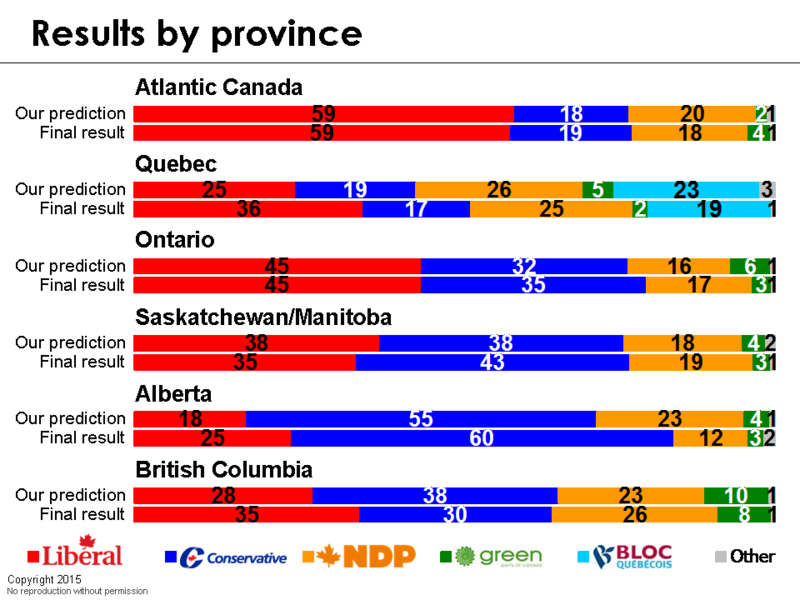 While we had excellent regional representation in this election, particularly in Ontario and Atlantic Canada, we underestimated Liberal support in British Columbia and Quebec and this is ultimately what threw off our final prediction. In closing, we would like to thank the 124,425 Canadians who generously responded to our surveys since January. We would also like to acknowledge sincere appreciation of our partners at iPolitics who did a great job in covering this election. We would also like to thank those who have provided advice, comments, and feedback throughout the election, particularly in the world of social media. Finally, we congratulate all those who participated in the political process and recognize the passion and effort that they bring to Canadian democracy. Justin Trudeau and the Liberal Party are to be congratulated on having won a clear and decisive mandate to lead the country. Why doesn’t your summary statement deal with the fact that you were consistently the outlier for the last two weeks, and the most inaccurate all that time? I am sure Justin and the Liberal Party won’t last very long. Excessive Tax and Over spending ” NOT WORK!! !” in the modern world. Look at Greece and other countries. Excessive Tax and Over spending ” WILL NOT WORK!! !” in the modern world. A breath of fresh air with the election of the Liberal party and a new outlook.Its time to move on from the worst period in Canadian politics. bc & quebec were impossible. The research was indeed voter friendly and accurate in a majority of case is my opinion. Thank you for including me in your survey. Thank to all of you ‘new’ voters who turned up polling stations to cast your ballots for change. Harper got his standard group of blind followers who refuse to educate themselves on what a self centred, bigoted, small minded PM we had. You ‘new stock’, aborigibal, young, minority and/or disenfranchised Canadians made the difference. Thank and praise yourselvss for stepping up and disposing of a Canadian tyrant. As for the Liberal spending and taxation we will soon find out what will be. Funny thing with Harper’s tax reform – my take home pay stayed at 58% of my gross income. No gain for me there. Anyway, I am prepared for the CPC Chicken Little’s and Glen hasn’t let me down. Just tell me Glen, how will the Libs not last long as they gave a majority. I think the Tories are in for a few terms wandering the wilderness. Especially if investigations reveal wrongdoings in the PMO’s office and the Duffy affair is about to rear it’s ugly head and is pointed directly at Stephen Harper. What else will they find. As for Mr. Harper, the old Chinese proverb comes to mind – may you live in interesting times. Jim:He will only last for 4 years. Do you forgot about the Liberal Party of Canada sponsorship scandal. The corruption and the dishonesty already started before justin took office. If we allow the the Libs to rule too long you will be taking home less than 50 % of your gross income. Jim: How could the disenfranchised have made the difference – did they vote or did they not vote-seems to me some logical issue here????? The liberal press did there best to get Justin elected or should I say unionized press – Justin offered so much to so many unions it will be interesting to see how he handles the pressure – Looks like we are about to duplicate Kathleen Wynne nationally – As for P.M. Harper he did a great job and he is not a bigot but will be perceived in the long run as one of the best P.M. we have ever had – Enjoy the boutique Justin he is out in 4 years. On a dark and stormy night I always whistled walking a churchyard. The dead never arose to greet me and so Glen and pals dog whistle all you want your Conservative Party is dead and gone just like the Dodo. Glen is one dyed in the wool conservative and he is wrong about Justin Trudeau. Trudeau will last! Stephen, like Harper, cannot see the harm that the Harper Government has done to Canada. Hopefully we will recover.